I'm taking a break from the day-to-day for a few days and article and blog reviews are the diet for that period of time. Enjoy. Steve Layman got his degree in journalism but made his living in commercial real estate. Licking County is lucky he did. His touch has made Licking County a better place to live, work, and buy goods and services. 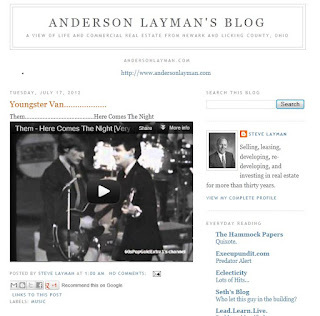 His blog, Anderson Layman's Blog, lets him put to use those journalistic skills and share his "view of life and commercial real estate in Newark and Licking County" as the tag line reads. He's a prolific blogger with a lakeful of the life side and a pipeline of the commercial real estate side. Bookmark his blog for both.